From the Center of Clinical Neuroscience (T.Z. ), Neurological University Clinic Carl Gustav Carus, University of Technology, Dresden; NeuroPoint Patient Academy and Neurological Practice (M.L. ), Ulm; Department of Neurology (B.T. ), Center of Neuroimmunology, Philipps-University, Marburg; Bonn Neurological Practice (S.S.); Neurological Practice (H.A. ), Munich; Department of Neurology (L.K. ), University Hospital Münster, Münster; Centre for Multiple Sclerosis (J.H. ), Jewish Hospital Berlin; Kassel and Vellmar Neurology Practice (C.L. ), Vellmar, Germany; Oxford PharmaGenesis (C.A-M.C. ); Oxford PharmaGenesis (J.A.F. ), United Kingdom; and Novartis Pharma GmbH (C.C. ), Nuremberg, Germany. Objective To assess the long-term real-world benefit–risk profile of fingolimod in patients with relapsing MS in Germany. Methods This analysis used data from the noninterventional real-world study, Post-Authorization Non-interventional German sAfety study of GilEnyA (PANGAEA), to assess prospectively the persistence, effectiveness, and safety of fingolimod over 36 months (±90 days) in Germany. 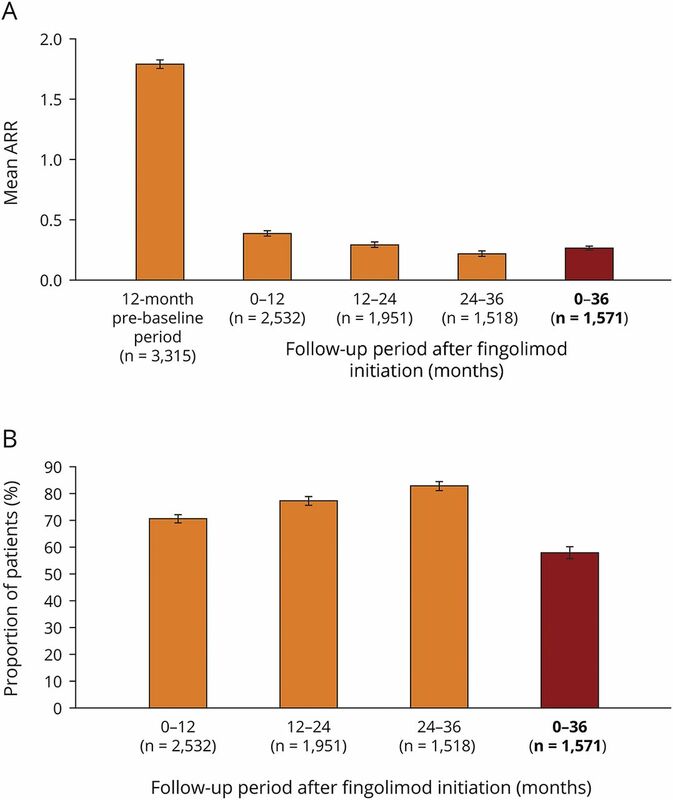 For inclusion in the effectiveness analysis (n = 2,537), patients were required to have received fingolimod for the first time in PANGAEA, to have at least 12 months of data, and to have completed each 12-month follow-up period. For the safety analysis (n = 3,266), patients were additionally allowed to have received fingolimod before enrollment. Results At baseline, 94.7% of patients in the effectiveness analysis had received a previous disease-modifying therapy. After 36 months, 70.4% of patients were still receiving fingolimod. Over this period, annualized relapse rates decreased to 0.265 (95% CI: 0.244–0.286) from 1.79 (95% CI: 1.75–1.83), and mean Expanded Disability Status Scale scores remained stable (mean change from baseline: +0.049 [95% CI: −0.015 to +0.114]). In total, 16% of patients had 6-month confirmed disability improvement, 12.5% had 6-month confirmed disability worsening, and 52.4% were free from relapses and 6-month confirmed disability worsening. Adverse events (AEs) and serious AEs were experienced by up to 23.4% and 3.9% of patients, respectively, during any of the 12-month follow-up periods. The frequency and nature of AEs were in line with previous findings. Conclusions Using systematically collected data from PANGAEA, this analysis demonstrates the sustained effectiveness, high persistence, and manageable safety profile of fingolimod over 36 months. Fingolimod (Gilenya, Novartis Pharma AG, Basel, Switzerland) is approved in Europe for second-line use in patients with relapsing MS (RMS) or first-line use in patients with rapidly evolving severe RMS.8 This eligible population differs from that in pivotal fingolimod phase 3 RCTs with respect to baseline comorbidities, concomitant medications, disease activity, and previous DMT experience.9,–,11 A large, prospective, 5-year Post-Authorization Non-interventional German sAfety study of GilEnyA (PANGAEA) was initiated to generate real-world data, reassessing the effectiveness and safety of fingolimod in clinical practice.8 A published interim analysis from PANGAEA highlighted the favorable benefit–risk profile of fingolimod over 12 months, which was consistent with the pivotal fingolimod RCTs.12 Here, we used 36-month follow-up data from PANGAEA to evaluate the long-term benefit–risk profile of fingolimod. An ethics committee provided approval before study initiation and had jurisdiction over the medical director of the study. The study was conducted in accordance with the Declaration of Helsinki. Written informed consent was obtained from all participants to document their data before inclusion in the study. For inclusion in the present analyses, patients were required to have at least 12 months (±90 days) of follow-up data and to be receiving fingolimod at the end of each follow-up period being analyzed (±90 days). In addition, as part of the analysis of clinical outcomes (effectiveness analysis), patients enrolled in PANGAEA were required to have received fingolimod for the first time in PANGAEA. For safety outcomes (safety analysis), patients were included in the analysis irrespective of whether they received fingolimod for the first time in PANGAEA or in clinical trials before PANGAEA; this ensured that the largest number of patients were included. At PANGAEA enrollment, baseline characteristics were assessed by the treating neurologist during interviews or through medical examinations. During the 36-month follow-up period, outcomes were assessed at each visit (month 1 and every 3 months thereafter), and data were recorded in standardized electronic case report forms. Effectiveness outcomes investigated were therapy continuation rates, annualized relapse rates (ARRs), disability outcomes were measured using Expanded Disability Status Scale (EDSS) scores, and proportion of patients free from both relapses and 6-month confirmed disability worsening. For safety outcomes, adverse events (AEs) and serious AEs (SAEs) were classified using the Medical Dictionary for Regulatory Activities. The assessment criteria for AEs were not predefined; physicians were requested to report any undesirable event noted during the observation period. Definitions for effectiveness and safety outcomes have been provided in footnotes of the relevant tables and figures. Effectiveness and safety outcomes were assessed during the 0–12-month (±90 days), 12–24-month (±90 days), 24–36-month (±90 days), and 0–36-month (±90 days) follow-up periods. Reasons for study discontinuation were assessed for the entire 36-month follow-up period. Data for categorical variables are presented as the number and proportion of cases in each category. For continuous variables, data are summarized using mean values, 95% CIs, SDs, and medians. For proportions of patients, 95% CIs were calculated using the exact (Clopper–Pearson) method. ARRs and associated 95% CIs were analyzed using a negative binomial distribution model and logarithm of the time on study as an offset variable. Data were included in the analysis up to the point of treatment discontinuation. If patient data were missing, or if patients were lost to follow-up, data were taken into consideration up to the point of discontinuation. The effectiveness analysis was conducted in patients receiving fingolimod for the first time as part of PANGAEA, in which 3,317 patients were assigned a treatment group, 2,537 patients had at least 12 months of follow-up data, 1,997 patients had up to 24 months of follow-up data, and 1,518 patients had up to 36 months of follow-up data (figure e-1, links.lww.com/NXI/A98). The safety analysis also included patients who had previously received fingolimod and encompassed 4,190 patients assigned to a treatment group, 3,266 with at least 12 months of follow-up data, 2,596 with up to 24 months of follow-up data, and 2,014 with up to 36 months of follow-up data (figure e-1). Baseline demographic and clinical characteristics were similar between the effectiveness and safety analysis cohorts (table e-1, links.lww.com/NXI/A99). In particular, 94.7% of patients in the effectiveness analysis and 93.9% of patients in the safety analysis had received a previous DMT, with the majority in both cohorts having received interferons (47.6% of patients in the effectiveness analysis and 48.0% of patients in the safety analysis) or glatiramer acetate (23.5% of patients in the effectiveness analysis and 23.0% of patients in the safety analysis). Effectiveness outcomes were analyzed in the population of patients who received fingolimod for the first time in PANGAEA. In patients with assessable data, after 36 months of follow-up, 70.4% had continued therapy with fingolimod. The proportion of patients who continued therapy with fingolimod following each of the 12-month periods remained similar, being 88.7% during the 0–12-month period, 90.3% during the 12–24-month period, and 89.9% during the 24–36-month period. After 36 months of fingolimod treatment, the ARR was reduced to 0.265 (95% CI: 0.244–0.286) compared with 1.79 (95% CI: 1.75–1.83)12 in the 12-month period before PANGAEA enrollment (figure 1A), and 58.2% of patients (95% CI: 55.8–60.7) were free from relapses (figure 1B). When data were stratified into 12-month periods, the effect of fingolimod on the ARR that was observed after 12 months (ARR: 0.386 [95% CI: 0.360–0.414])12 was sustained over the subsequent 12–24-month (0.292 [95% CI: 0.266, 0.321]) and 24–36-month (0.218 [95% CI: 0.192–0.247]) periods, with ARRs numerically decreasing during each period (figure 1A). The proportion of patients who were free from relapses increased numerically in each respective 12-month period (0–12 months: 71.0% [95% CI: 69.2–72.7]; 12–24 months: 77.7% [95% CI: 75.8–79.5]; 24–36 months: 83.3% [95% CI: 81.3–85.1]; figure 1B). (A) Mean ARR during the 12-month prebaseline period before fingolimod initiation and during each 12-month follow-up period and in the overall 36-month follow-up period following fingolimod initiation. 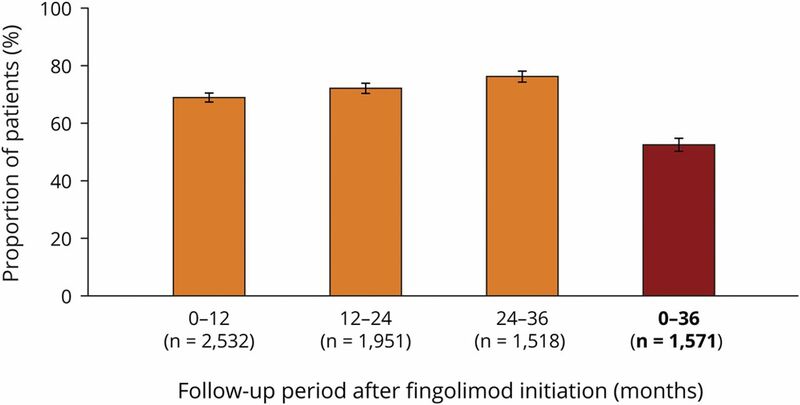 (B) Proportion of patients with relapse(s) during the 12-month prebaseline period before fingolimod initiation and during each 12-month follow-up period and in the overall 36-month follow-up period following fingolimod initiation. aRelapses were assessed in accordance with the clinical judgment of physicians in the real world. Relapses were not included in this analysis if they occurred within 30 days of a previous relapse that had already been included. Error bars show 95% CI. ARR = annualized relapse rate; n = number of patients. Data relating to the ARR for the 12-month prebaseline and 0–12-month periods were taken from Ziemssen T, Lang M, Tackenberg B et al. Clinical and demographic profile of patients receiving fingolimod in clinical practice in Germany and the benefit–risk profile of fingolimod after 1 year of treatment: initial results from the observational, noninterventional study PANGAEA. Neurotherapeutics 2018;15:190–199, with the permission of the copyright holders (authors). After 36 months of fingolimod treatment, EDSS scores remained stable from baseline (change in the EDSS score from baseline: +0.049 [95% CI: −0.015 to +0.114]; figure 2A), 16.0% (95% CI: 14.2–17.9) of patients had 6-month confirmed disability improvement, and 12.5% (95% CI: 10.9–14.3) had 6-month confirmed disability worsening (figure 2b). When data were stratified into 12-month periods, EDSS scores remained stable in the first 12 months of treatment (+0.103 [95% CI: +0.061 to +0.145])12 and in the 12–24-month (−0.031 [95% CI: −0.068 to +0.006]) and 24–36-month (−0.022 [95% CI: −0.063 to +0.018]) periods (figure 2A). The proportion of patients with 6-month confirmed disability worsening increased numerically in each respective 12-month period (0–12 months: 3.6% [95% CI: 2.9–4.4], 12–24 months: 7.5% [95% CI: 6.4–8.8]; 24–36 months: 9.7% [95% CI: 8.3–11.4]; figure 2B), but remained numerically lower than the proportion of patients with 6-month confirmed disability improvement during each respective 12-month period (0–12 months: 7.3% [95% CI: 6.3–8.4]; 12–24 months: 10.5% [95% CI: 9.2–11.9]; 24–36 months: 11.7% [95% CI: 10.1–13.4]; figure 2B). (A) Mean change in the EDSS score during each 12-month follow-up period and in the overall 36-month follow-up period following fingolimod initiation. (B) Mean proportion of patients with 6-month confirmed disability improvement or 6-month confirmed disability worsening during each 12-month follow-up period and in the overall 36-month follow-up period following fingolimod initiation. aConfirmed disability improvement was assessed in accordance with the decreases in the EDSS score from baseline, with confirmation of the decrease in disability made at a visit in the absence of a relapse: a decrease of at least 1 point regardless of baseline EDSS scores. bConfirmed disability worsening was assessed in accordance with the increases in EDSS score from baseline, with confirmation of the increase in disability made at a visit in the absence of a relapse: a 1.5-point increase from a baseline EDSS score of 0; a 1-point increase from baseline EDSS scores of 1–5.0; and a 0.5-point increase in baseline EDSS scores of 5.5 or more. Patients for whom MS was a cause of death were considered to have confirmed disability worsening irrespective of baseline EDSS score or change in the EDSS score. Error bars show 95% CI. EDSS = Expanded Disability Status Scale; n = number of patients. Data for the 0–12-month change in the EDSS score were taken from Ziemssen T, Lang M, Tackenberg B et al. Clinical and demographic profile of patients receiving fingolimod in clinical practice in Germany and the benefit–risk profile of fingolimod after 1 year of treatment: initial results from the observational, noninterventional study PANGAEA. Neurotherapeutics 2018;15:190–199, with the permission of the copyright holders (authors). After 36 months of fingolimod treatment, 52.4% (95% CI: 49.9–54.9) of patients were free from relapses and 6-month confirmed disability worsening (figure 3). When stratified into 12-month periods, the proportion of patients free from relapses and 6-month confirmed disability worsening numerically increased over time, being 68.8% (95% CI: 67.0–70.6) in the 0–12-month period,12 72.0% (95% CI: 70.0–74.0) in the 12–24-month period, and 76.1% (95% CI: 73.9–78.2; figure 3) in the 24–36-month period. Mean proportion of patients who were free from relapses and 6-month confirmed disability progression during each 12-month follow-up period and in the overall 36-month follow-up period following fingolimod initiation. Error bars show 95% CI. N = number of patients. Data for the 0–12-month period were taken from Ziemssen T, Lang M, Tackenberg B et al. Clinical and demographic profile of patients receiving fingolimod in clinical practice in Germany and the benefit–risk profile of fingolimod after 1 year of treatment: initial results from the observational, noninterventional study PANGAEA. Neurotherapeutics 2018;15:190–199, with the permission of the copyright holders (authors). Safety outcomes were analyzed in the overall population of patients who received fingolimod in PANGAEA. This included patients who received fingolimod for the first time in PANGAEA and patients who received fingolimod in previous clinical trials. Data on reasons for premature study discontinuation were available for 1,436 patients. During the 36-month follow-up period, the most frequently reported reasons for study discontinuation were patient decision (27.8%) and AEs (24.6%; table 1). During each 12-month period, the proportion of patients reporting AEs numerically decreased during the 36-month follow-up period, being reported by 23.4%, 20.9%, and 20.8% of patients during the 0–12-, 12–24-, and 24–36-month periods, respectively. The proportion of patients reporting SAEs remained stable during the 36-month follow-up period, being reported by 3.9%, 3.9%, and 3.6% of patients during the 0–12-, 12–24-, and 24–36-month periods, respectively. The most commonly reported AEs of special interest during the 36-month follow-up period were hypertension, increased hepatic enzyme levels, and increased alanine aminotransferase levels, which were reported by 2.1%, 2.0%, and 0.7% of patients, respectively (table 2). The proportion of patients reporting hypertension numerically decreased from 2.2% (31 patients) during the 0–12-month period to 1.2% (11 patients) and 1.0% (7 patients) during the 12–24- and 24–36-month periods, respectively. The proportion of patients reporting other AEs of special interest remained stable during each 12-month follow-up period (table 2). The present analysis further complements data from the pivotal phase 3 RCTs by evaluating outcomes in patients who received fingolimod in accordance with the European fingolimod SmPC.8,–,11 As stated in the SmPC, fingolimod is mainly used as a second-line DMT unless patients have highly active disease, in which case fingolimod can be used as a first-line treatment.8 Consistently, approximately 94% of patients in PANGAEA received previous DMTs before initiating fingolimod, whereas in the pivotal phase 3 RCTs, 24%–59% of patients received fingolimod first line.9,–,11 This is despite patients entering PANGAEA having similar mean ages and disease durations, and more active disease at baseline than at enrollment into these RCTs.12,13 In line with previous observations, the majority of patients had received injectable DMTs (interferons and glatiramer acetate) before initiating fingolimod in PANGAEA. As part of PANGAEA, patients received fingolimod in accordance with its SmPC, and, therefore, results are likely to be generalizable to the population of patients receiving treatment in routine clinical practice. In the present analysis, ARRs continued to decrease in each year of fingolimod treatment and the proportion of patients remaining free from relapses increased. The effect of fingolimod on relapse outcomes was most pronounced after 24–36 months, which suggests that its benefits are sustained and may increase with duration of treatment. However, the accrual of effectiveness over time may also be attributed to responder bias, in which patients for whom fingolimod was effective would be most likely to continue receiving this treatment. A strength of this analysis is that it presents the largest real-world data set for a population of patients receiving fingolimod in accordance with its SmPC and being managed as part of routine clinical practice at neurologic centers across Germany. This study has now collected data systematically for a longer period than the core phase of the pivotal phase 3 RCTs and demonstrates the sustained favorable benefit–risk profile of fingolimod. A limitation of this analysis is that MRI data were not consistently collected during the study, and therefore, it is not possible to assess composite disease end points such as no evidence of disease activity. Furthermore, data collected reflect the use of fingolimod within a German population of patients with MS and may not be generalizable to other countries, particularly those in which the use of fingolimod is restricted or the treatment label is different. For example, in countries where fingolimod is mainly used as a first-line therapy, its observed effectiveness may differ from that in countries, such as Germany, where fingolimod is mainly used as a second-line therapy. In this study, it is not possible to determine whether patients have used DMTs as prescribed. The present study lacks a comparator arm, and safety data were not collected in a protocol-driven way, as would be the case for an RCT; however, the findings can be considered in the context of other real-world studies. Owing to the chronic, incurable nature of MS, patients require lifelong treatment with DMTs. It is therefore important that patients are treated early with DMTs that have sustained effectiveness coupled with a manageable safety profile; this is likely to lead to high treatment persistence. Avoiding relapses and disability worsening is associated with improved health-related quality of life and reduced health care costs and resource use.30,–,34 Furthermore, sustained reductions in disease activity are likely to be associated with favorable clinical outcomes.3 This study highlights the potential of fingolimod as a DMT for the long-term management of patients with RMS. The study was sponsored by Novartis Pharma GmbH. T. Ziemssen served on the scientific advisory boards of Bayer, Biogen, Novartis, Merck Serono, Teva, Genzyme, Roche, and Celgene; received speaker honoraria from Bayer, Biogen, Sanofi Genzyme, Celgene, Roche, Novartis, Teva, Almirall, and Merck; served as section editor of BMC Neurology; received research support from Biogen, Sanofi Genzyme, Novartis, and Teva; and served as an expert witness for glatiramer acetate. M. Land reports no disclosures. B. Tackenberg served on the scientific advisory boards of Biogen, Bayer Healthcare, Novartis Germany, Merck Serono Germany, Octapharma Germany, CSL Behring Germany, GRIFOLS Germany, Alexion, Celgene, and Sanofi Genzyme; received speaker honoraria from Biogen, Bayer, Novartis, Merck Serono, Octapharma, CSL Behring, Grifols, Alexion, Celgene, and Sanofi Genzyme; consulted for Biogen, Bayer Healthcare, Novartis, Merck Serono, Octapharma, CSL Behring, Grifols, Alexion, Celgene, and Sanofi Genzyme; and received research support from Bayer, Biogen Idec, Novartis, Sanofi-Aventis, Marburg University Trust, Förderverein Neurologie, German Myasthenia Gravis Society, and German Society of Neurology. S. Schmidt served on the scientific advisory boards of Novartis, Merck Serono, Bayer Vital, Biogen, Genzyme, and Teva; received travel funding and/or speaker honoraria from Novartis, Merck Serono, Bayer Vital Biogen, Genzyme, and Teva; and received research support from Bayer Vital. H. Albrect served on the scientific advisory boards of Merck, Biogen, Sanofi-Aventis, Novartis, and Mylan and received travel funding and/or speaker honoraria from Merck, Novartis, Biogen, and Celgene. L. Klotz served on the scientific advisory boards of Genzyme, Novartis, Biogen, Roche, Merck, and CSL Behring; received travel funding and speaker honoraria from Novartis, Merck Serono, Biogen, Roche, Genzyme, and CSL Behring; and received research support from Novartis, Biogen, CRC, Federal Ministry of Education and Research. J. Haas received honorarium from Biogen Idec, Merck Serono, Bayer Schering, Teva-Aventis, Novartis, and Octapharma. C. Lassek served on the scientific advisory boards of and received travel funding/speaker honoraria and research support from Merck Serono, Genzyme-Sanofi, Novartis, Roche, and Biogen. C.A.-M Couto and J.A. Findlay have been employed by Oxford PharmaGenesis. C. Cornelissen has been employed by Siemens Healthcare and Novartis. Disclosures available: Neurology.org/NN. The PANGAEA study group assisted in the collection of data and provided technical support.
. Treatment decisions in multiple sclerosis—insights from real-world observational studies. Nat Rev Neurol 2017;13:105–118.
. Optimizing therapy early in multiple sclerosis: an evidence-based view. Mult Scler Relat Disord 2015;4:460–469. ABPI. Guidance—demonstrating value with real world data: a practical guide. 2011. Available at: abpi.org.uk/media/1591/2011-06-13-abpi-guidance-demonstrating-value-with-real-world-data.pdf. Accessed December 20, 2017.
. Expanding the use of administrative claims databases in conducting clinical real-world evidence studies in multiple sclerosis. Curr Med Res Opin 2015;31:1029–1039.
. Gilenya EPAR Product Information. 2014. Available at: ema.europa.eu/docs/en_GB/document_library/EPAR_-_Product_Information/human/002202/WC500104528.pdf. Accessed December 20, 2017.
. Safety and efficacy of fingolimod in patients with relapsing-remitting multiple sclerosis (FREEDOMS II): a double-blind, randomised, placebo-controlled, phase 3 trial. Lancet Neurol 2014;13:545–556.
. Clinical and demographic profile of patients receiving fingolimod in clinical practice in Germany and the benefit–risk profile of fingolimod after 1 year of treatment: initial results from the observational, noninterventional study PANGAEA. Neurotherapeutics 2018;15:190–199.
. The PANGAEA study design—a prospective, multicenter, non-interventional, long-term study on fingolimod for the treatment of multiple sclerosis in daily practice. BMC Neurol 2015;15:93.
. Patient satisfaction and healthcare services in specialized multiple sclerosis centres in Germany. Ther Adv Neurol Disord 2018;11:1756285617748845.
. Multiple sclerosis in the real world: a systematic review of fingolimod as a case study. Autoimmun Rev 2017;16:355–376.
. Real-world use of fingolimod in patients with relapsing remitting multiple sclerosis: a retrospective study using the national multiple sclerosis registry in Kuwait. CNS Drugs 2014;28:817–824.
. Healthcare resource use and relapses with fingolimod versus natalizumab for treating multiple sclerosis: a retrospective US claims database analysis. Curr Med Res Opin 2014;30:1461–1471.
. Comparative analysis of first-year fingolimod and natalizumab drug discontinuation among Swedish patients with multiple sclerosis. Mult Scler 2016;22:85–93.
. Canadian experience with fingolimod: adherence to treatment and monitoring. Can J Neurol Sci 2016;43:278–283.
. A serial 10-year follow-up study of brain atrophy and disability progression in RRMS patients. Mult Scler 2016;22:1709–1718.
. Inclusion of brain volume loss in a revised measure of ‘no evidence of disease activity’ (NEDA-4) in relapsing-remitting multiple sclerosis. Mult Scler 2016;22:1297–1305.
. Study design of PANGAEA 2.0, a non-interventional study on RRMS patients to be switched to fingolimod. BMC Neurol 2016;16:129.
. Long-term safety and effectiveness of fingolimod: 7 year data from the LONGTERMS study. Mult Scler 2015;21:280.
. Fingolimod in relapsing multiple sclerosis: an integrated analysis of safety findings. Mult Scler Relat Disord 2014;3:494–504.
. 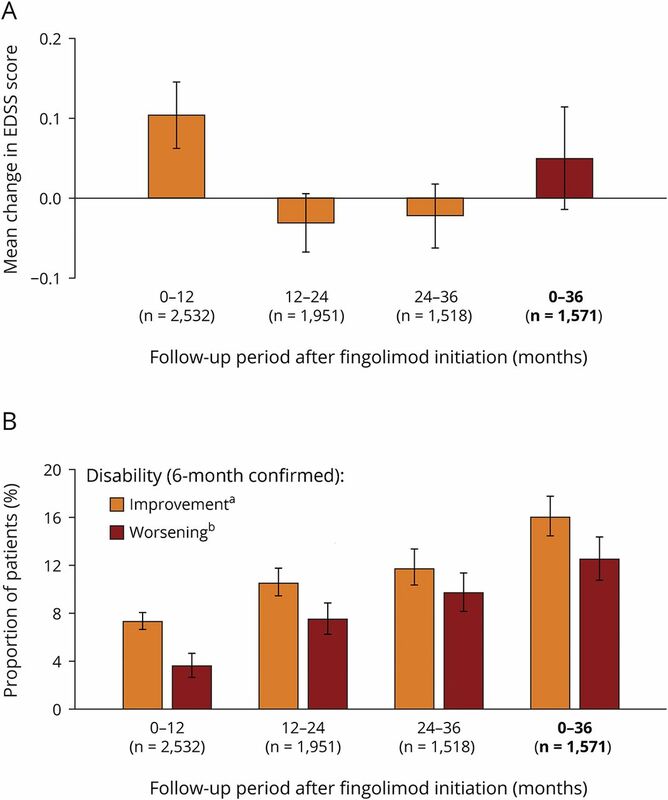 Long-term effects of fingolimod in multiple sclerosis: the randomized FREEDOMS extension trial. Neurology 2015;84:1582–1591.
. Safety and tolerability of fingolimod in patients with relapsing-remitting multiple sclerosis: results of an open-label clinical trial in Italy. Neurol Sci 2017;38:53–59.
. The real-world effectiveness and safety of fingolimod in relapsing-remitting multiple sclerosis patients: An observational study. PLoS One 2017;12:e0176174.
. Comparison of efficacy and safety of oral agents for the treatment of relapsing-remitting multiple sclerosis. Drug Des Devel Ther 2017;11:2193–2207.
. Current disease-modifying treatment of multiple sclerosis. Mt Sinai J Med 2011;78:161–175.
. European Multiple Sclerosis Platform. New insights into the burden and costs of multiple sclerosis in Europe: results for Germany. Mult Scler 2017;23:78–90.
. Costs and quality of life of patients with multiple sclerosis in Europe. J Neurol Neurosurg Psychiatry 2006;77:918–926.
. New insights into the burden and costs of multiple sclerosis in Europe. Mult Scler 2017;23:1123–1136.
. Estimation of the cost of MS in Europe: extrapolations from a multinational cost study. Mult Scler 2007;13:1054–1064.